Borough Ordinance No. 7, dated September 16, 1902, was the beginning of the use of gas in the Borough of Elkland. In this ordinance privileges of the use of various streets, lanes, and alleys, for laying pipes to conduct gas, was granted to the Potter Gas Company. Shortly after this date the gas lines were laid and gas was furnished all those that wanted it for lights, cooking, heating, etc. Possibly some will remember Mr. L. W. Brown who was timekeeper on the job of laying the lines and afterwards read the meters and collected the gas bills here I the town of Elkland. There are probably a lot of "old timers" in Elkland who remember how wonderful it was when the first street lights were turned on to lighten up the dark street corners. A lot of people used gas for lights in their houses and it proved out far superior to the old kerosene lamp. Evidence of the old gas lighting days can still be found in lots of houses and stores in the Borough. In 1904, some will remember, F. J. Reid took charge of the Gas Company business in Elkland and during that same year, probably during the latter part, R. H. Hammond, better known as "Rube" Hammond, took over the company affairs. After his untimely death, the Potter Gas Company put Mr. T. A. Fessler in charge and for many years the gas bills were paid at Mr. Fessler’s Drug Store. Shortly after the gas was first introduced into Elkland the main line was extended down the Cowanesque Valley to Nelson, then to Lawrenceville, and branched out there into Elmira and various towns up the Tioga River Valley. In 1927, while still under the charge of Mr. Fessler, the Potter Gas Company sold its holdings to the North Penn Gas Company with whom all are familiar. In 1930 Mr. Lynn Merrill was placed in charge of the Gas Company business for a short time and during this same year the office was moved to its present location on Main Street and Mrs. Helen Wood (Mrs. Clark Wood) was placed in the manager position. In 1942 Mrs. Wood retired from the position of manager of the Gas Company and Mr. Harry Suhr took charge. In 1946 Mr. Suhr retired to accept a position in Wellsboro and the affairs of the Company were placed in the hands of Mr. Ward Casbeer, who had been the serviceman under Mr. Suhr. Mr. Casbeer, well known and liked by all, died in 1949 and L. R. Borgeson was transferred from Westfield to Elkland to take charge. Various men and women who are not mentioned in this brief account of the Gas Company history need not feel slighted because it was under their supervision and by their hard work that the Gas Company has expanded from its humble beginning in 1902 to its present day standing in the lives of the people of this community. The Tubbs homestead, the red brick landmark on Route 49, just east of Osceola, for the first time in its 32-year history is no longer Tubbs property. It was sold at auction on Saturday to John Smith Pease of Wayne, N.Y. and Wa-Nita Kreisler, Elkland Borough secretary. Under the hammer, the brick house and a small frame building at the rear went for $10,000. The house was the first brick building to be erected in Tioga County, being built for Robert Tubbs and his father, Col. Samuel Tubbs, Sr. in 1829. Brick for the building, for the construction of the present Moren block in Elkland and for several other brick buildings in this area came from clay on the Tubbs farm just north of the home. The "brick pond" under the hill at Osceola still marks the scene of the pioneer ceramic industry. Originally the brick home, and attached frame portions, was the showplace of Tioga County and for many years the family seat of the descendants of the original owner. It contains 16 rooms, which have been utilized in the past 10 year period for three apartment dwellings. Mrs. Fleda Tubbs, the widow of the late John Tubbs, disposed of all her holdings here last Saturday and will live in the south. Farm lands remaining and a one time tenant house went to the family of Elsie Tubbs Mull after the death of Mr. Tubbs. Samuel Tubbs, Sr. who had the house built for a son, Robert, never owned land in Osceola. In fact he never owned land in Elkland but he and other family members not only claimed or owned every inch in what is now Elkland borough but held large acreage in Osceola and Nelson Townships. A Connecticut Yankee who was virtually dispossessed of lands in the Wyoming Valley during the long struggle between people of Connecticut and Pennsylvania known as the Pennamite War, Tubs came to the Cowanesque in the spring of 1811. A physical giant of a man, Tubbs served the American cause during the Revolutionary War and spent one winter at Valley Forge. He even marched against the six Indian nations with General Sullivan but his war record held little weight with Pennsylvania claimants of lands he held in the Wyoming Valley. After the war he moved to Newtown (Elmira) then led a party into the unsettled Cowanesque Valley in 1811. The families of his sons and daughters purchased or took every acre of land in what is now Elkland Borough. He sold portions of these holdings to other settlers and with the earnings purchased or took all lands between the west Elkland Borough line and the village of Osceola. One of his most profitable land transfers concerned the selling of a mill and lands I the southeast portion of the Elkland – Elkland Township to others months before he had legal Pennsylvania claim to the land. In true Yankee fashion he fought fire with fire – by outsmarting Pennsylvania land owners in the Cowanesque he more than replaced what had been taken from him at Wyoming. Although Robert Tubbs, a son, was recognized as the paper owner of some 800 acres which once surrounded the "brick house", the Colonel called the shots until his death. The blood of this Yankee strongman flowed into the veins of every pioneer family to live on Elkland lands and other offspring took lands in Osceola and Nelson. His daughters wed the sons of Ryons, Taylors, Hammonds, Stevens, Mascho, and Coates. His sons and grandsons mixed with the Taylors, the Stulls and the Dorrances, Hoyts, Gleasons, etc. At least a quarter of the present population in the center of the Cowanesque Valley can trace their families back to the robust Yankee and his strong sons and daughters who first farmed the flats now called Elkland and Osceola. The pioneer cemetery was on Barney Hill. Here Mrs. Permelia Taylor and her sons, Philip and Mitchell Taylor, and other settlers were buried. In 1882 the bodies of Mrs. Taylor and her sons were removed to Osceola and re-interred in the cemetery at that place. The Presbyterian Graveyard near the Presbyterian Church is another early burial place. Interments were made here up to about 1885. A large number of those who died in Elkland during the earlier years of its history were buried in the cemetery at Osceola. The Highland Cemetery Association of Elkland was incorporated January 26, 1885 by L. K. Parkhurst, B. H. Parkhurst, G. G. Dorrance, C. L. Pattison and J. S. Ryon. The capital stock of this association is $2,000, and the cemetery owned and controlled by it situated on the hillside in the northern part of the Borough. The cemetery at Elkland contains the bodies of several early pioneers of this place. Among them are John Ryon, Sr. who died in 1832, age seventy-two; George Dorrance who died in 1881; Joel Parkhurst who died in 1894 at the age of ninety-four; col. Marinus Stull who died in 1864; David Hammond who died in 1862; and John Hammond who died in 1874. The Osceola Cemetery contains the bodies of some of the Elkland pioneers. Permelia Taylor who died in 1808 and was buried in Barney Hill was later removed to Osceola Cemetery; Reuben Cook who died in 1829; Col. Samuel Tubbs who died in 1841; Lintsford Coates who died in 1864, and Col. Lemuel Davenport who died in 1878. The Elkland Ice Manufacturing Plant on Constitutional Avenue has been sacrificed in the interest of flood prevention. Owned by the Adelbert Smith Estate, the plant has been purchased and demolished by Elkland Borough to provide land for the second phase of the Federal flood prevention works for Elkland Borough which is now in building. The major portion of the building was built in 1933 and was part of a $45,000 investment required to manufacture ice locally. The plant was originally powered by gasoline engines. An addition was built in 1937 to meet the needs of an expanding business and required a further expenditure of $4,000. Before the home refrigerator and freezer became household items, the plant annually produced between 1000 and 2000 tons of ice. To meet this increasing demand, new wells were driven and the plant modernized and converted to electricity in 1946. Mr. Smith said that his facilities represented a $100,000 investment. The improved facilities provided for the manufacture of six tons of ice daily. Regular deliveries were made by the firm to Addison, Lawrenceville, Wellsboro, Galeton, Elmira, and all Cowanesque Valley towns as far west as Potter Brook. As the demand for home ice receded, the payroll was cut and a limited work force manufactured ice for processing plants and commercial growers of food. Since the death of Mr. Smith, Mr. Harold Grover has operated the manufacturing facilities at the plant. The plant was operated throughout the past summer but discontinued in the fall after the Borough condemned the property. Mrs. Smith does not intend to rebuild due to economic conditions so the Borough of Elkland will lose another small industry, one which provided a unique service for a wide area, it being the only remaining ice manufacturing facility between Olean, N.Y. and Owego, N.Y. In December, 1964 the Pattison National Bank merged with banks in Knoxville, Liberty, Tioga, and Wellsboro to form the Northern National Bank and Trust Company. E. A. Blackwell became Manager of the Elkland Branch at that time and held that office until his retirement January 1, 1966. Donald Russell became Branch Manager then and held that office until he resigned in April, 1972. Constance Elliott became the first woman to serve as Branch Manager at the Elkland office in June, 1972. In October, 1971, Northern National merged with banks in Troy, Towanda, and Wysox, and became known as Citizens and Northern National Bank and Trust Company. In October, 1971 a new branch office was opened in Monroeton, and in May, 1972, Ralston joined the bank to give us ten banking offices in three counties, Tioga, Bradford, and Lycoming. 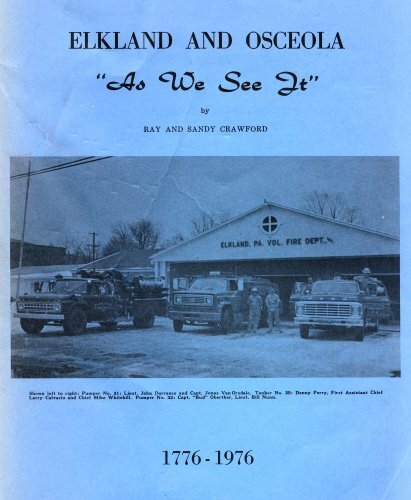 At the time of the first merger in 1964, Elkland had total assets of $2,900,000. At the close of business December 31, 1975, Elkland had total assets of $7,500,000. The five offices which merged in 1964 had combined assets of $16,000,000. today, the total assets are $85,000,000. In May, 1975 the bank became a state chartered bank, and the name was changed to Citizens & Northern Bank. The Elkland office underwent extensive remodeling in 1970-71. The Pattison National Bank on June 9th, 1954 placed into operation a Tellers’ Machine, the second mechanical device to be utilized by the local banking house in recent weeks. The two new mechanical units are the first of a series of machine improvements which will completely modernize and mechanize the 58 year old firm within the next three year period. John O. Pattison, bank president, said yesterday that the mechanization was being patterned after operational procedures now used by the most modern banks in the country. Before reaching a decision concerning the new installations at the Elkland bank, officials had made a lengthy study of devices used elsewhere. Responsible for the change-over is E. A. Blackwell, vice-president and cashier, and a 28-year member of the firm, who has had the mechanization under advisement and planning for a four year period. Mr. Blackwell informs that the new machine installations are only the first of a series of improvements. Although complete information was not made available, it is known that some of the planned machine installations will require additional space and it is anticipated that the bank ultimately will utilize a portion of the second floor of the bank building. The installation of the time saving banking machines will delete lengthy window operating procedure thus shortening deposit time as much as 50 per cent. The new tellers’ system will require depositors to fill out individual deposit slips. The machines provides for a machine posted receipt as evidence of amounts of money deposited, proving by number the identity of the depositor, the amount of the deposit, with pinpointing of totals to expedite posting of accounts. The note accounting machine, which has already been placed in operation greatly simplifies note accounting through mechanical means. The Pattison National Bank has been a national institution since 1896 and was the outgrowth of the original Elkland bank established here as a private bank by Joel Parkhurst in 1867. In 1886 this private bank was succeeded by J. Parkhurst and Co., which in turn became the C. L. Pattison Company. At the death of Mr. C. L. Pattison in 1896, Orville Pattison was made bank president and joined with the federal system. Mr. John O. Pattison, now president of the firm assumed leadership of the bank at the death of his father, Orville in 1926. The bank building was erected in 1888 and 1889 by C. L. Pattison to house the J. Parkhurst Bank and Pattison offices. Because the bank Pattison Brothers are direct opposites, in stature, only their close friends know that they are twin brothers, who were born to Orville and Susan Pattison at Antrim, Pa. on October 17, 1880. The Pattisons moved to Elkland in 1887 and the brothers grew up I the bank headed by their father from 1896 until 1926. Charles L. Pattison, vice-president in charge of bookkeeping, joined the bank of his father in 1910. Before entering the local firm, he attended Manlius Military Academy for one year, Ohio State University 2 years, and received business training at the Bryant Stratton School at Buffalo. He held positions in Buffalo and New York City before returning here to join the family firm in 1910. In 1908 he married Josephene Donovan of Elkland. The couple have four children and seven grandchildren. Mr. Pattison is a member of the Parkhurst Memorial Presbyterian Church. Mr. John O. Pattison has been a member of the Pattison National Bank since 1898 when he joined the firm at 18 years of age. He was educated in Elkland schools and Manlius Military Academy. He held offices of assistant cashier, cashier and vice-president before becoming president of the bank in 1926; the office which he now holds. Mr. Pattison is also president of the First National Bank of Knoxville which he was active in organizing in 1911. He is a member of the Parkhurst Memorial Presbyterian Church and has been an Elder since 1926; a Past Master and Life Member of the Osceola F. & A. M. and served on the Elkland Borough Council for 16 years. Seventy-nine year old banking house founded by Joel Parkhurst marks 5th birthday as National Institution on June 2nd. Deposits in the Pattison National Bank which celebrates its 50th birthday, June 2, 1946, stood this month at an all time high of over $2,000,000.00 and increase of 100 percent over the boom year of 1929. It is recalled that the Pattison Bank has showed a consistent growth in the face of depression, having been closed only during the period of the Federal bank holiday at which time all banks were ordered closed. They were one of the first banks in Tioga County to reopen on notification by the Comptroller of the Currency. They have weathered every depression that has occurred. In 1932, deposits were $598,000.00; in 1933 during the worst of the depression, deposits climbed to $644,000; in 1934 still higher to $798,000; in 1935 deposits were $916,000; in 1936, they passed the million mark for the first time running up to $1,100,000 and from there on to $2,000,000 in 1946. Joel Parkhurst founded this bank as a private bank in Elkland in 1867, making the age of the bank 79 years. In 1886, this private bank was succeeded by J. Parkhurst and Co., which was succeeded by C. L. Pattison and Co., at C. L. Pattison’s death in 1896, Orville Pattison was chosen president of the bank and the establishment joined the National Banking system under the name of The Pattison National Bank. At Orville Pattison’s death in 1906, his son John O. Pattison succeeded him and is still President of the bank. Executive officers now are J. O. Pattison, President; C. L. Pattison, Vice President; E. A. Blackwell, Vice President and Cashier; Francis Kohur, Assistant Cashier. The present board of directors being J. O. Pattison, C. L. Pattison, E. A. Blackwell, Mrs. Anna P. Thomason, John Bastwick. While this bank celebrates its 50th anniversary as a National institution, the bank dating back to its inception as a private bank, started by Joel Parkhurst, has been continuously in operation for seventy-nine years. Tabbed "the handsomest and best appointed office building in Tioga County" by the May 3, 1889 edition of the Elkland Journal, the Pattison National Bank building has retained its fine outward appearance for the past 55 years and is still a credit to the community’s business section. The building was erected in the winter of 1888 and 1889 by C. L. Pattison to house the J. Parkhurst Bank and the Pattison offices. It was constructed by Jay Beard builder, of Elkland. Architects were Messrs. Pierce and Dockstader of Elmira. Ground was broken for the building on September 8, 1888, the building was finished and dedicated May 1, 1889. The leather industry has developed in this country because hemlock bark is available for tanning. The production of leather goods in Westfield and Elkland, and the manufacture of glass in Wellsboro, the county seat are outstanding industries of the county. Other products of the county include condensed and evaporated milk and plumbers’ supplies and steam fittings. Maple sugar is a well known product of the county. The hearts and diamonds of maple sugar from the Tioga County were prized confections of the children of the earlier generation. In 1870 Tioga County produced 145,209 pounds of maple sugar which sold from Williamsport to Chesapeake Bay. Beautiful scenery, good hunting, and fishing, have made Tioga County a favorite place for vacationing. It was a prized hunting ground for the Seneca Indians and in the early 1800’s white hunters were paid bounty of $8.00 a head for wolves and panthers. Tioga county was separated from Lycoming County in 1804. It is named from the largest river, the Tioga, which flows into New York State and, uniting with the Chemung River, joins the North Branch of the Susquehanna River, flowing back into Pennsylvania at Historic Old Tioga Point, now site of Athens, Bradford County. In the days when the forests were passable only by Indian trails the Tioga and Susquehanna Rivers have entrance to Pennsylvania settlers from New York and to the Connecticut Yankees who suggested with the Pennamites to maintain disputed land claims along the Wyoming Valley. In 1787 Samuel Baker, Tioga County’s first settler, came down the Tioga from Connecticut and built his cabin on the flats between the Cowanesque and Tioga Rivers. Baker later moved to New York State because he feared his land claim was not valid. Many residents of this community, which this year had its centennial anniversary, perhaps are unaware that, previous to 1851, the community was known as "Pindarville". A public meeting 100 years ago brought a decision to change the name to Osceola, after a famous Seminole Indian of that name. First settler of "Pindarville" – at least the first to remain, was William Holden, who had made a previous settlement at Lawrenceville around 1788. He came to what is now Osceola about 1795. The greater portion of the lands within the borough boundaries of Osceola were purchased from the State of Pennsylvania by, and patented to, John and James Strawbridge. The early industries were: sawmills of various types; carding mills; manufacture of woodenware, such as sugar bowls, salt dishes, and whiskey kegs by Josiah Holcomp; potash and pearlash, manufacture of brick, blacksmith shops. The banking house of Morgan Seely was established in 1877 and in 1897 changed its name to the Cowanesque Valley Bank. There were two tanneries. One was erected in 1852 by Hoyt Tubbs and Truman Crandall on the Cowanesque River opposite the mill pond and one was owned by Robert Hammond and located 1866 on Holden Brook. Sash, blind and door factory was built in 1854 by Enoch Steen and Eleazer Clark and the cheese factory was established 1872 by William Bosard and James F. James. The first "Inn" was opened in Osceola by Nathaniel Seely in 1812. The Osceola House was the second hotel in the village, built in 1851 by Allen Seely. It was twice destroyed by fire, then rebuilt and has been converted since into a two family residence. Mary Ann Landon was the first teacher in Osceola and she taught school in 1812 in an old log house upon the Island Stream, near the Abel Hoyt residence. The first school building was erected in 1822 and was called the Bulkley School house. The next school building was built in 1871 at a cost of $2,200 near the Presbyterian Church. It burned eight years ago and since then the former Children’s Home has been converted into the Osceola School. The Osceola High School was established in December 1860 for the purpose of affording facilities for pursuing an academic education. The enterprise was set on foot by a number of leading citizens, who subscribed the necessary money. The second and third stories of the H. & J. Tubbs block being fitted up for chapel, recitation rooms, and apartments for non-resident students. The school opened with 100 students in December 1860. The faculty was composed of Anderson Robert Wightman, A. B., principal; Samuel R. Thayer, A. B., assistant principal; Jane Stanton Wightman, preceptress; Mary Abigail Stanton, assistant preceptress; Prof. Isaac Gunn Hoyt, instructor in music. A large boarding house containing 24 rooms, known as "The Castle on the Hill" was built in 1861 and an equipment of philosophical apparatus purchased. Various changes in the faculty was made up to 1866, when the school was formally closed and was succeeded by a select school, taught in 1867-68 by James Huntington Bosard, and 1869-70 by Charles C. Ward. The Osceola School of Musical Instruction was opened in 1872 by Prof. Isaac Gunn Hoyt. It existed for four years, both vocal and instrumental music being taught, and diplomas awarded those taking a full course of instruction. Elkland originally was a piece of land 10 miles deep extending 11 miles along the New York State line, and included all of Osceola. The village of Osceola was larger than the hamlet of Elkland and many of the valley’s leading citizens resided here. The Presbyterian Church first appeared as the Congregational Church in the early 1830’s. By 1835, the Presbyterian form of government had been adopted and in the Fall of that year a rough board "Tabernacle" was erected in Elkland, where the Parkhurst Church now stands. The Elkland and Osceola Churches since 1844 were one society but the people of Osceola desired a church of their own, so erected the present building in 1851. The tabernacle went up in flames in 1853 and was not rebuilt until 1868. Elkland Methodist and Presbyterians alike worshipped at the Osceola Presbyterian Church after the fire and many Elkland Presbyterians still worshipped at Osceola after the Methodist and Presbyterians in 1856 built the "Union" meeting house, where the Elkland Methodist Church now stands. The Rev. Carol Ames is now pastor of the Osceola Presbyterian Church. On the western bank of Holden Brook near its mouth was the first place of interment for pioneer settlers between 1795 and 1815. The Osceola Cemetery Association was incorporated in 1876 and the Fairview Cemetery Association was incorporated in 1882, the grounds of both now being adjoined. The Methodist Episcopal Church was the pioneer church of Osceola. Captain Ebenezer Taylor was a local preacher of this denomination in the first years of the century. His colaborers in the wilderness were David Jay, Elihu Hill and many pious women. Meetings were held wherever people could be got together – in the cabins of the new settlers, in barns, I the improvised school houses and in the open air. The early Methodists were partial to this kind of worship, and gathered the scattered population from far and near into huge camp meetings, where they spent days and nights in preaching and prayer, intermingled with shout and song. Three were held in Osceola. The first one convened on the river bank upon the farm of George Newton Bulkley, in September 1828. A lock-up was built under the pulpit, in which disorderly persons were impounded. About the camp at night a watch was set to see that peace and quiet were maintained. To summon the meeting a dinner horn was sounded, which echoed far and wide through the forests. The meeting was had in charge by Presiding Elder Parker Buell, who did most of the preaching. Rev. Joseph Pearsall, famed for his vocal powers, led in the singing. Rev. Samuel Conant, Peter Sliter and others were present and assisted in the services. Many conversions attested the extraordinary success of this effort. In September 1829 another camp meeting was held, upon the farm now owned by Henry Tubbs. The camp was located by a large spring on the flat east of his barns. The meeting began on Wednesday and was continued until Monday of the next week. The guard and guardhouse beneath the sacred desk were instituted as a terror to evil doers. Immense crowds were in attendance. Presiding Elder Abel was in command of the camp, ably assisted by Revs. Asa Orcutt, Amos Cary and John Copeland. They preached with such force and effect that the listening multitude were wrought into an ecstasy of while "testifying" fell insensible or were struck down by religious excitement. Joseph Bennet and Miss Lamphear what is mysteriously called "the power". When sympathetic bystanders would have applied restoratives the presiding elder sternly forbade them – it was a visitation of God. The crowds were very demonstrative, and the fervent "amen" or responsive shout attested their appreciation of every good point scored by the ministering clergymen. The third camp meeting was held by a large spring on lands of Charles L. Hoyt, north of the Holden Brook road, which are yet covered with timber. It assembled in 1835, and was conducted by Rev. Nathan Fellows, assisted by Rev. Darius Williams and others. Although the attendance was large the interest manifested was not so intense as on the previous occasions. Some however were hopefully converted. These meetings did not pass without infractions of good order. At the camp on the south side of the river a skunk was thrown into the prayer ground, and the meeting had to be adjourned for the night. On the North Hill a disorderly person felled a small tree upon the worshipers as they were bowed in prayer. The early Methodists at Osceola were somewhat given to Asceticism. At a quarterly meeting held at the school house "in the Norways" about 1838 Rev. Theodore McElhany stood guard at the door while the presiding elder was conducting love feast within, and refused admission to all who wore the "gaudy attire" of artificial flowers or bows of ribbon upon their bonnets. Just at what time Methodist ministers began to ride the "circuit" incuding Osceola is not certain. It was about 1820. The first regular appointments were once in four weeks, and the circuit was seventy miles around. Campbell’s Soft Serv was established in the year of 1963 and has served the Cowanesque Valley as a friendly and ever growing business. Situated on a lot which was washed out by the 1935 flood, when a home owned by Mr. and Mrs. Carl Morton was completely destroyed by the rearing Holden Brook Creek, it was built and owned by Mrs. Betty Campbell and the late James W. Campbell, who passed away May 19, 1971. Mr. and Mrs. Campbell, following World War II, operated a Red & White grocery store in the "Big Block building" situated on Main Street which was once an Academy. The Campbells operated the store for seventeen years, adding on a meat processing business which was growing so great that they decided to build their own processing plant. In their new building, they not only processed meat, but also carried on a line of groceries and archery. In the summer of 1963, the Campbells added on to their building a Soft Serv service, and then kept adding on for short orders and southern fried chicken. After the death of her husband, Mrs. Campbell did away will all but the ice cream business and short orders. The business grows greater yearly and services not only the Cowanesque Valley, but also southern New York State. A great deal of business comes from tourist traffic on Route 49 from all the states of the Union. The business employs five girls during the season which extends from April to October. Each Well Known by Their Nickname Alone. Local born and graduate of class of 1943, she has devoted her entire life to her work, and dedicated herself to improve her home town. No local lady could serve as a better inspiration to our younger girls in Elkland. "Education is treasure, and culture never dies." Like his forefathers, he carried o the tanning industry through its better years, and held the reins to the last second when man made products replaced natural animal hides. He maintains his contact with the community, and supports many projects which benefit the town and people he has known so well. You certainly would "believe in Santa Claus" if you were in Elkland around Christmas time when "Santa’s Wagon" pays visits to approximately 100 families each year. If you would visit the American Legion Community Center the week before Christmas, you would think you were in Santa’s Toyland. You may ask, "What is Santa’s Wagon?" Very simple. Santa’s Wagon was organized four years ago in the office of The Elkland Journal when the pastors in this area met with Editor D. Lee Stoddard in making Christmas plans for needy families. An organization of this sort had been in formation for the past 10 years. Originally, the needy families were taken care of by the American Legion Auxiliary, the Sylvinas of the Osceola Presbyterian Church, the Nelson Brotherhood, backed by the Elkland Lions Club. An auction would be held by the Lions Club each year near Christmas time to raise money for this purpose; $300 to $400 would be realized from this auction and the money would be used to purchase food for the food baskets. But the Lions were not quite satisfied in seeing that a few families were taken care of. They began to think there must be other families who are never reached. The thought came to them as they were assisting Santa Claus at a community Christmas party at the Elkland Ellison High School Auditorium, December 24, 1945. As they were to leave the auditorium, they saw six little youngsters, half-dressed, very timid, standing on the outside looking in. At that time, they vowed, never again did they want to see such a pitiful sight, and so they started from that year to promote the project which began to branch out to Osceola, Nelson, Farmington and other rural districts. From year to year since 1945, the project began to grow. Then four years ago in The Journal office, when making plans to see that every needy home was taken care of, it was decided to name the campaign "Santa’s Wagon." G. K. Smith was named president and served two years. The past two years, Mr. and Mrs. Tony Kowski have been cochairmen. Letters were sent out to all organizations and business places seeking representatives and also asking for donations. These representatives meet early in the fall, elect officers and outline the plans for the project. Names are submitted and carefully screened by Supervising Principal C. H. Wood and the pastors in this area. Forty organizations participate. More than $1000 has to be raised each year to offset the expenses. Good used toys and clothing are solicited. Canned food is collected by the AFL Union Auxiliary in its hall and through the Elkland Joint School under the supervision of C. H. Wood, canned food is brought in by the students. The Home Economics Department has made several dolls which are placed in the boxes. Two broadcasts are set up for two Saturday afternoons in December, this year, December 10 and December 17, at The Journal office by Al Carpenter of Corning’s Station WCBA. The response is amazing! Each grocery store is given a certain number of families to fix food baskets for. About two or three days before Christmas, a group from the 40 participating organizations meets at the American Legion Community Center where they are given a card bearing the name of the needy families, their ages, needs. These boxes are then packed way into the wee hours of the night and prepared for delivery which is made by the Lions Club. The Boy Scouts, Girl Scouts and Cub Scouts plat a big part in assisting "Santa’s Wagon". Wherever they are needed, they are always on the alert. As Santa approaches the doors of these needy families, children shout with joy; parents may shed a few tears of appreciation. There is never a family in this area that can say they didn’t have a Merry Christmas – sometimes possibly only through "Santa’s Wagon". Tale of a "giant" have been rife in Elkland for many years. Rumors, inflated to fact, claimed that the Cardiff Giant was built here. As usual, rumor has a basis in fact. There was a giant created here, but not the Cardiff Giant. The same man, George Hull did build both giants, but the one constructed in Elkland was done about eight years later. Yes, P. T. Barnum was involved in both frauds, and the rumor that a giant was built in the rear of what is now Harding’s Hardware is correct. Howard Hallock discovered the following account, and was far sighted enough to preserve it. It would be interesting to learn what eventually happened to our giant. 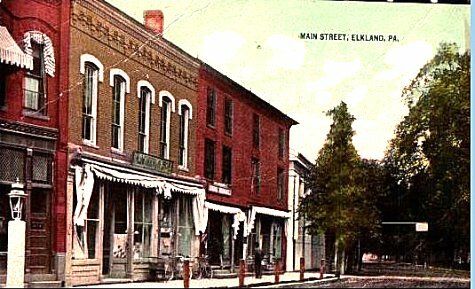 In this Bicentennial era, the verification of Elkland’s "claim to fame" may encourage others to delve into local history, and develop a sense of pride in our town and valley. George Hull, the maker of the Cardiff Giant, its originator – Phineas T. Barnum the capitalist who paid for it – W. A. Conant the man who planted as well as discovered it – full details of the manner in which the swindle was carried out. The true history of the "Colorado petrified man", that was exhibited in this city is given herewith. It was made at Elkland, a little mountain town in Northern Pennsylvania, near the New York State line, by George Hull maker of the Cardiff Giant. P. T. Barnum became interested in the scheme, and supplied part of the capital. The figure was taken to Colorado, buried there, and finally dug up, in accordance with a carefully arranged plan. An adroit deception was practiced in regard to the results of the scientific test, which it claimed was made. Ground stone, ground bones, clay, plaster, blood, eggs and other materials plus thousands of dollars in experiments. Hull’s career before he went to Elkland – his secret work there – long and laborious experiments – the arrangement with Barnum – planting the figure in Colorado a complete exposure of the scheme. (From a special correspondent of the Tribune). Elkland, Tioga County, Penn., Jan. 21 – This little isolated borough will hereafter be noted as the birthplace of the "petrified" Colorado Giant. Arriving here last evening a few minutes before 9 o’clock, within twenty minutes I had visited the "ice house" in which the Colorado Giant was molded and baked brown; had picked out of the rubbish a fragment of the foot and ankle of an elder brother of the giant, who happened to be spoiled in the making; and before midnight had learned every important particular connected with the origin and travels of this curious fraud. The public will not feel much surprise on learning that the ingenious fabricator of the "missing link" is George Hull, who made the Cardiff Giant. Hull lived four years in the farm house opposite this country tavern, and built in the rear of it, so that it is invisible from the road, his "ice house" giant manufactory. Hull’s confederate was P. T. Barnum. With all his disclaimers, it is now plain that Barnum was both wet nurse and godfather to the Colorado Giant, and furnished the money and part of the strategy to foist the humbug on what proved to be an incredulous world. Arriving in Hornellsville, on the Erie Road, yesterday forenoon, I visited E. J. Cox, Justice of the Peace; told him of the information which made the presumption strong that the Cardiff Giant and the Colorado Giant were half brothers and that he was acquainted with their origin and whole family history. Mr. Cox said he had had no hand in the manufacture of the Colorado Giant, beyond lending Hull some money for the project; that he owned an interest in the humbug, but had been so misused by Hull that he felt himself no longer under obligations to keep the matter secret. "These papers will explode the whole affair," he said, handing me a bundle of affidavits and letters which he took from a drawer in his desk. These papers, which for the present are omitted from this narrative, are conclusive testimony of the truth of the story which Mr. Cox and others told me. "You can verify my story," said Mr. Cox, "by going to Elkland, thirty-three miles southeast from here, and just across the Pennsylvania line. There you can see the kiln in which the giant was baked, and learn a good deal from the villagers, and, perhaps, Mr. Hull himself." Mr. Cox was easily induced to accompany me, in order to save time by relating on the way the history of the fraud. While he was procuring a conveyance, I learned from a substantial citizen of Hornellsville that Mr. Cox, who is between thirty-eight and forty years of age, had resided there the greater part of five years; that he had been a cigar manufacturer, and, by neglecting his business to engage in politics, had nearly exhausted his means. In view of that fact his Democratic friends have recently elected him Justice of the Peace. Mr. Cox’s reputation for fair dealing and veracity is good. "This affair will make a sensation where I am known," Mr. Cox said, as we rode along. "My friends know that Hull ‘beat’ me out of some money, but they don’t know how, or why. I never had any confidence in Hull’s business honor, but since we had been in each other’s confidence, like brother to brother. I had come to depend on his word with me. Altogether, this Colorado Giant business has cost me about $10,000 or $12,000. There was not until recently any written agreement between us. It was understood as a matter of honor that I had an interest in the Giant. But when Hull sold a large share to Barnum I made him sign an agreement with me. I played my part all right till they began to crowd me out. All I wanted was my money back. I have given up all hopes of that, and now I propose that they shall hear from me." "How long have you known Hull?" "About eighteen years. He is fifty-five years of age, but he does not look to be over forty-two. He came from Connecticut when he was a young man, and brought a swindle along with him. He was the inventor of the "star-back" playing cards, which are marked, and was traveling through the country with his cousin. The latter would go in advance and sell the cards, while Hull, who was fine looking, well dressed and of good address, followed, and fleeced the amateur gamblers." "He had trouble in Binghamton, was arrested for swindling, and then paid a visit to his elder brother, who was living at Fenton, nine miles from Binghamton. His brother had two daughters from Hull had ever seen. Hull made an impression on his nieces, and disgraced their family, and threw the community into a state of disgust and excitement by marrying one of them, with whom he is still living, but not on the good terms that ought to prevail between husband and wife. They have always lived apart from society, which could never forgive Hull for marrying his niece." "He settled down in Binghamton and became a cigar manufacturer. I was his foreman. In 1869 he went to Chicago, and was gone nine months without anybody’s knowing where he was. There he made the Cardiff Giant, had it buried on the farm of a nephew at Cardiff, near Syracuse. Barnum wanted to buy the gypsum giant, but Hull thought it was worth a million, and realized about $60,000 on the humbug before his nephew revealed the fraud for being treated just as Hull has treated me. "Hull took his money to Binghamton, erected a brick block, and engaged extensively in his business. He told me several times that he would ‘humbug the public yet’. He was a peculiar man, and spent a great deal of money and time in making experiments with gases and stone, claiming that he could discover the principles of alchemy and produce any of the metals. He read scientific books, although he is uneducated, he had a ready mind for getting at the principle of a thing. He was born skeptic and materialist. He used to declare that the world was a fraud, and all the people in it; that the American people were never so happy as when they were being humbugged. Darwin’s theories fascinated him, and he used to say if he could get the scientific men quarrelling over the origin of man, and throw the religious world into a hurly-burly of doubt and controversy, he should be perfectly satisfied, and win great fame. He declared that he would spend the rest of his life in working a humbug which would explode the truths of the bible and electrify the scientific world. In 1872 he was forced into bankruptcy, with liabilities of $30,000. I upbraided him for allowing his business to go to wreck, but he said he must go away from mankind to carry out a project which he had been maturing." "Captain Amsbry, a cousin of Hull’s wife, was living in Elkland," continued Mr. Cox. "To him Hull had previously sent about $12,000 worth of tobacco and fixtures, and Amsbry was conducting a cigar business in Elkland in his own name, with Hull’s capital. On January 18, 1873, Hull went to Elkland and I came to Hornellsville. But before that – I think in the Fall of 1872 – Hull went to Boston, saying he had made arrangements with a publisher to issue a history of the Cardiff Giant." "Hull rented 300 acres in Elkland, and pretended to carry on a farm, but did not pay expenses by it, and Captain Amsbry continued the tobacco business. As soon as he was established, in the Summer months of 1873, he built an "ice house", about 20 x 14 and 12 feet high. In this he built a narch kiln of brick 9 x 5 and 3 ½ feet high. This was very strongly built. The "ice house" was tightly fastened on the sides and was provided with a small skylight. Everybody knew that Hull spent most of his nights in the ‘ice house’ and it became a standing joke to ask Hull when he was going to fill his ‘ice house’, or to ask, ‘Where’s Hull?’ the reply being, ‘Hull’s one into his hole, I guess he’ll be out in the morning’. "Hull secured the services of a New York sculptor, named Fitch, who was with him several months and was well paid, but who was discharged, as Hull told me, because Fitch hadn’t any more skill than himself. Fitch told him that if he had studied sculpture when he was young, he (Hull) would have been the greatest sculptor living. Fitch showed discontent when he was discharged, and Hull has kept him quiet with presents since. Hull had trouble with Captain Amsbry, because the latter refused to carry on the tobacco business in his name, and thus keep Hull’s property from his creditors. Hull was obliged to compromise, and he was continually in financial difficulty. So he engaged me to move to Elkland and take charge of the cigar business, I putting in what capital I had. He gave me to understand that his project was almost completed, and that he would need to go away for some time, and wanted me to look after his affairs, and promised me an interest in his success. Sometime before that I had asked him how he was getting on. ‘Well’, he replied, ‘I’ve got the old man off my hands, and if he comes out done brown, he’ll startle the community’. "I went to Elkland January 18, 1877," said Mr. Cox. "About the 1st of February Hull said his work was done, and on the evening of March 11 he came to me, all enthusiasm, and said: ‘Cox, I want you to see the old man; we’ve got him out all right’. He gave me to understand that the Giant had been baking a whole year. And I think Hull made his own charcoal. "When I entered the ‘ice house’ the Giant was lying on a board supported by two stout saw horses. A derrick-like structure stood over the kiln, and had been used to take the Giant out. Barrels of plaster of Paris, ground bone, ground stone, clay and other materials were in the corners, and there were many plaster molds lying about and on shelves. "Hull was in ecstasies. The Giant was dimly outlined by the light of an old coal stove. Said he, ‘Cox, I would give $100 if you could have been with Case and me, the night we took him out. We had a rope around his neck, and a pulley up there, and how we worked and tugged away on that rope. I went through torture – my whole existence hung by that rope. It seemed as if I lived a thousand years while we were pulling him out, and when he hung up there by the neck, I tell you he looked alive; he looked as if he was going to talk! Don’t tell me that the people won’t be fooled by this!’ So Hull went on in the most extravagant talk. "Hull called my attention to the four inches of tail which adorned the extremity of the figure’s back bone, and struck a match so that I could see it plainly. Said he, ‘Cox, look at that tail! Take hold of it!’ Then rising, for we were stooping, he exclaimed, ‘that tail alone is worth a million’. "I called his attention to the fact that the man was not perfect. He struck matches to show me the differences in the toes. He said it would not do to have the man perfect; that there was nothing perfect about it. It had been made so as to have it not like anything ever discovered of the human or brute creation. The arms he said were made disproportionately long, so as to make it appear something between a man and an ape, he explained how he had used 250 gross of steel needles, which had been fastened in lead, a dozen or so at a time, and with these he had gone over the entire surface, of the figure, before it was baked, producing that ‘goose-skin’ appearance which has puzzled scientific men. "’Suppos’, said I, ‘some scientist proposes to go into him, what are you going to do?’ ‘Oh’, said Hull, ‘I’ve got that fixed’, and he pointed to two places where, he said, the scientists could have a foot of surface to work on, where they would be sure to strike a bone. ‘If they want to go in anywhere else’, said he, ‘we shan’t let ‘em’." "I think Hull must have spent $10,000 or $12,000 in making his experiments and molding and baking his giant," said Mr. Cox. "Case also had invested heavily in the speculation. Hull had succeeded in making a stone giant, for the baked composition was just like stone, but it was a white elephant on his hands. He had no money to plant it with. This led him to apply to Barnum, whom he visited at Bridgeport, Conn. When he returned, Hull said that Barnum said he wasn’t going to buy a big in a bag, and he would send out a man to look at Hull’s invention. "Barnum did send George Wells, of Bridgeport, who came quietly, stopped at Case’s Hotel, and let it be understood that he was a horse-trainer who came to look at some Hambletonian stock in the neighborhood. Case took him out driving, and in the evening he was taken into the ‘ice house’, where he viewed the wonder. He departed on the early morning train. Hull told me that Barnum, if he was satisfied, was to pay $2,000 down, and have a certain share in the giant, and share the expenses of planting, etc. He also said that Wells had expressed himself as more than satisfied; in fact, he was perfectly astounded, and he believed Barnum would buy. "The bargain was made, and the day after I saw the giant – that is March 12 – the Giant was wrapped with a great many yards of cotton cloth, and put in a stout box well bound with iron, which was provided with a false bottom on steel springs. The box was marked ‘fine machinery’, and directed to Bridgeport, Conn., I think to George Wells. At midnight it was put in a wagon and taken to Addison, eleven miles distant on the Erie road. Hull made a second trip to Bridgeport, where, on March 26, an agreement was drawn up and signed by the stockholders of the Giant company, Barnum, Hull, Wells and Case." "I think their first intention," Mr. Cox continued, "was to bury the Giant in some isolated Connecticut valley, but Barnum said it would never do, and Hull, when he returned, said they had changed their plans, and were going to plant the Giant in the Rocky Mountains. Hull said they must have some fossilized objects to be dug up near the spot where the giant was to be planted. I managed it so that a boy who had caught a big snapping turtle sold it to Robert Traver, who kept the rival hotel. Then I went to Traver and bought the turtle for a dollar; killed it, and wit it Hull molded a turtle out of the same substance of which the giant is composed. A salmon trout was also imitated, and the turtle and trout were subjected to a three weeks’ baking in a shee-iron over and retort made expressly for the purpose. "Hull went to New York April 8, and joined W. A. Conant, who was in Barnum’s employ. They shipped the giant to Colorado Springs, and then reshipped it as local freight to Pueblo. Hull was absent about six weeks, and on his return told me that the giant was successfully planted. I believe that Conant went as a doctor or professor in charge of a party in search of geological specimens. Conant remained to watch the deposit, and had said he wouldn’t be surprised if they found a petrified man there some day. Hull denied this, I tried to reach a settlement with Hull. To make the sale to Barnum he had been obliged to conceal from Barnum my knowledge and interest. I could make no arrangement with Hull, getting only promises, and I told him I would have my pay or wash my hands of the whole business, and when he got ready to bring the giant to the surface, he would need to keep an eye on me. "I had returned to Hornellsville and engaged an attorney to look after my interest. In August, Barnum returned from Europe, and went to Colorado to ostensibly to look after his stock farm and lecture on temperance. His real object was to be near at hand when the giant was exhumed. Hull knew it would never do to have the Cardiff Giant man recognized as having anything to do with the Colorado Giant, so he assumed the name of George H. Davis, cut his hair short, shaved his mustache, put a hump on his back, and disguised himself as a stoop-shouldered farmer. I had time Hull in his travels and sent an affidavit to Conant showing up the fraud, so it would reach him about the day I supposed the giant would be dug up. "I subsequently got letters both from Hull and Conant urging that matters be hushed up until they could see and settle with me. Here are the letters – the originals. I was not disposed to take any more promises, and so telegraphed to Hull that if he attempted to move the giant I would expose the affair. He returned post haste, arriving in Hornellsville September 4. I met him on the street, but should not have known him if he had not spoken tome; he was cleverly disguised. I refused to have anything to do with him, and sent him to my attorney. Before the latter he brandished a revolver and threatened to shoot me, and then offered to settle by giving me one-twenty-sixth part of his interest. He drew up a contract to that effect, and then returned immediately to Colorado. "When Hull reached Pueblo, he found that Conant, who, as he expressed it, had been ‘foolilng’ with the giant, had broken off the head and one leg. Hull was enraged, and a quarrel ensued. However, the giant was skillfully mended, and the discovery was made according to the plan. Barnum appeared on the ground, and offered $20,000 for the ‘find’, which Conant refused with scorn. The people began to laugh at Barnum, and he offered a reward of $10,000 to any man who would prove that the giant was made by chisel. Of course, he ‘had them there’. Then came the test. Hull told me that Barnum paid Professor Taylor $100 and his expenses to go out and bore into the giant. Hull had lent an attentive ear to the talk of scientific men, and was astonished to learn that a kind of crystal ought to be found out boring into the arm of a petrified giant. Hull obtained crystal to correspond, and by sleight of hand exchanged it for the dust of the boring implement which was first handed to him by Professor Taylor." The last twelve miles of the ride over the hills to Elkland were traversed in darkness. A few minutes before 9 o’clock Mr. Cox left me at Robert Taylor’s hotel in Elkland, and drove three miles back to a tavern on his way home, in order not to excite the suspicion of Hull by his presence in the village. Mr. Traver was asked if he thought George Hull was the maker of the Colorado Giant? "Every man and child in the village knows he has been making something of the kind," he replied. "I can show you the building behind the house, just across the way, where the work was done." I accepted the offer to view the "ice house" by lantern light, and found everything as described by Mr. Cox. The arched cover of the kiln had been removed, and cabbages were lying three or four deep on one side. There was a box of plaster of Paris in one corner, and in another we picked up a part of the foot and ankle of a composition giant. It look like plaster of Paris, but it was a little darker and emitted a disagreeable odor. "The children call this the giant house," said Mr. Traver. "When the kiln was made, Hull told the mason to build it strong, as he was going to make it hotter than hell. We all knew that Hull was busy with some secret work here, for months at a time. He bought a skeleton of a man. He had several pails of blood sent to him from Corning. He used several hundred eggs, which, with the blood, I suppose, were mixed in with the powdered stone, ground sand, clay and plaster of Paris, which were obtained by the barrel full. He also had a lot of bones ground at Westfield. Then they bought a turtle of me, and a turkey of one of the neighbors in the Summer when it wasn’t fit to eat, and also killed a calf that was in no condition to butcher. The box that Hull sent to the railway station at Addison, weighed 950 pounds, and when I heard of the weight of the Colorado Giant, which was about what the contents of that box weighed, I said to myself that Hull was the originator of that humbug. Hull has been away from home for the last two weeks, but there are two or three in the village who know all about it." Captain Amsbry, the cousin of Hull’s wife, was next seen. He talked reservedly. He did not speak favorably of Hull. He said he knew nothing of his own personal knowledge about the Colorado Giant, except that Hull had been at work on something, and had often said that he would improve on the Cardiff Giant, and humbug the people yet. He had told Hull that the scheme would not succeed; that no one could humbug the people twice in the same way, in the same generation. On the way back to Traver’s Hotel I stepped into the bar room of the Elkland Hotel, and found Theodore D. Case, the proprietor, and one of the stockholders I the Giant, and William Potter, a confidant in the transaction, alone, and about to retire. They looked dazed when I asked them if they knew if Hull made the Colorado Giant, and invited me to a seat at the fire. I concealed the extent of my knowledge and enjoyed their subterfuges. "Have you seen the stone," said Mr. Case, interrupting himself, pulling his silk hat over his eyes, and looking into the fire. "What is it made of? What does it look like?" "What has Hull been making in his ‘ice house’?" "I understand," said Mr. Case, "that he has been at work on some invention. He patented a harness snap that slipped through his hands, and the man who got it made a million." "Yes," spoke up Mr. Potter, "he has been making a patent hay rake, too. He has been engaged on it a long time." "The boys out here say they have picked up plaster hands and feet near the ‘ice house’." Mr. Case laughed at this, which as addressed to him, and said, with a sarcastic tone: "It’s a pity they didn’t save ‘em, isn’t it, so they could compare them with this stone man, and see if they were the same." I told him I had just found one of the pieces, and added to the unpleasant feeling which was creeping over him by asking if he knew a New York sculptor named Fitch. "No," he replied, without once looking me straight in the face, and added, "Hull couldn’t have got no stone about here big enough to make that giant." "But they say it’s not natural stone; that it’s a composition; also that Barnum has an interest in it." "They do, do they? It puzzled them, does it?" added Case. "Well, if it is a humbug, it would be about right, wouldn’t it, to have Barnum leading off!" "Yes," piped in Potter, "and the people seem to think as much of Barnum as if he’d never humbugged ‘em." "Did Hull and Mr. Cox, of Hornellsville, have any trouble?" I asked of Mr. Case, who took a hasty glance from under his hat and replied, drawlingly: "Let me see, it appears to me they did." "The Cardiff Giant is worth almost as much as a curiosity now, as it was before the fraud was discovered," I suggested. "Yes," chimed in Potter, before Case’s eye could hold him, "and I tell you what it is, if I had made this stone man, I believe I’d tell just how it was made, and come out with everything." After more talk of this character, I left the two men to guess at the extent of my information, and returning to Traver’s Hotel found a valuable witness in the person of a young man named Louis W. Fenton, who said he helped to put the giant in the wagon when it was taken to the station. He was reserved at first, saying that he would like to see George Hull get his money back, but so far as "Old Case" was concerned, he would like to see the affair exploded. "It’s a wonder to me," he said, "that the secret hasn’t leaked out before." But Hull had spent several thousand dollars experimenting. Besides the eggs and blood and ground bones and stone and sand and plaster, I think Hull used some acids on it. I don’t think he had a retort. A piece of a man’s skull was put in the head, and bones were inserted in numerous places in the limbs. I knew they were going to take it to the Rocky Mountains. The first intention was to put it in some cave, but Hull said it would have to be buried in swampy ground to take out the strong smell there was about it. Babcock said George Hull’s first project was to make some kind of a strange animal, and Charley and I talked of making such an animal ourselves." Jerome Park was the center of attraction last week when Rick LaBarr staged a carnival for muscular dystrophy which netted $125. Rick is to appear on the "Salty Sam" TV program latter part of August and present the proceeds at that time. The affair was under supervision of the Elkland Borough Summer Recreational Program directors. It was the first town-wide event ever staged for the Muscular Dystrophy Association, although there have been a few neighborhood events. Rick LaBarr, a playground participant, was chairman. He was assisted by committee members Lavern Knickerbocker, George Potter, Jody Knickerbocker, Sharon Knickerbocker, Norma Van Cise, Mrs. Frances Miller and Mrs. Janet LaBarr. Events were: Bowling on the green, penny pitch, coin toss for dishes, sponge throw, fortune telling, ring toss, balloon break, bean bag toss, candy and book sales, and refreshments. A ventriloquial act, by Rick LaBarr, was one of the main attractions. A carnival for muscular dystrophy will be held this afternoon (August 15th) at Jerome Park. It is under supervision of the Elkland Borough Summer Recreation program directors and is to be held from 1 to 4 in the afternoon. It is the first town wide event ever planned for the Muscular Dystrophy Association, although there have been a few neighborhood carnivals. Rick LaBarr, a playground participant, is chairman. He will be assisted by the following committee members: Lavern Knickerbocker, George Potter, Jody Knickerbocker, Sharon Knickerbocker, Norma Van Cise, Mrs. Frances Miller and Mrs. Janet LaBarr. In case of rain, the carnival will be held inside the Softball Stadium, where there is sufficient shelter, director Thomas Socha reported. Planned are the following games and amusement features: bowling on the green, penny pitch, coin toss for dishes, sponge throw, fortune telling, ring toss, balloon break, bean bag toss, candy and book sales, and refreshments. Most of the games cost a nickel or dime, and chairman said. Stores in the local business section are being contacted for prizes and donations. Those who have already contributed are as follows: Davis Variety Stores, Wynkoop’s 5 and 10, Cerchie and Horton Western Auto, and Harding’s Hardware. There will be a personal appearance by "Danny and Rick", a ventriloquial act, pending the condition of Rick LaBarr’s dummy, Danny. Rick, a 13 year old ventriloquist, has entertained at various school and library events during the past year. Proceeds will be given to the Muscular Dystrophy Association, in care of Salty Sam on TV channel 13.